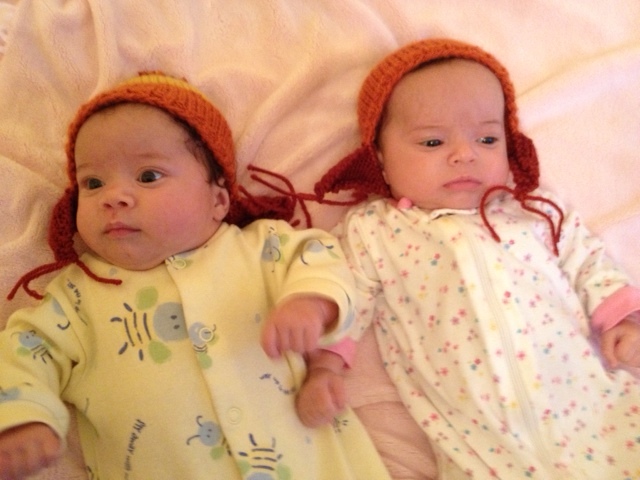 In January 2013, our family welcomed two new additions, my brother’s twin daughters, Octavia and Irene! 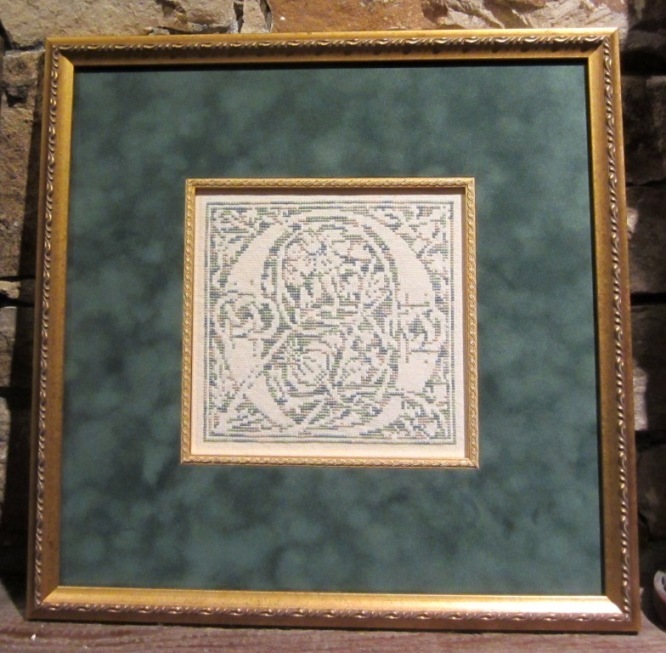 I wanted to stitch them something beautiful but not babyish, something keeping with the sophistication of their parents’ Spanish Renaissance wedding sampler. 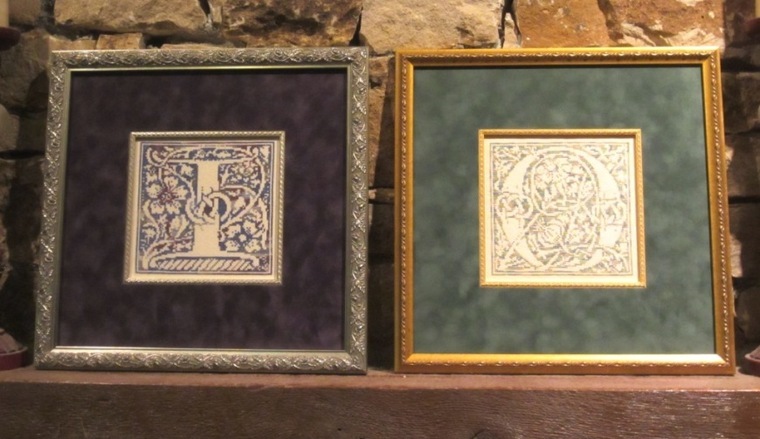 And I had just the projects in mind: M Designs Celtic Letters. I had seen them stitched up before and had been waiting for the right occasion to try them myself! …And then I went all crazy with the framing. Stitched on a lovely cotton evenweave that looks like handmade paper, with variegated/overdyed cotton threads. Click for larger images. I am thrilled with how they turned out. This was my first major project using overdyed threads, and I ran into some unexpected complications, which I will keep in mind, if I ever stitch more. The thread used on the Letter I changed color very gradually, giving me nice big blocks of violet, navy, plum, and grey; and I was able to more or less plan the placement of color throughout the design (like where the center of the flower is dark purple, but blue on the outside). The thread used in the Letter O, on the other hand, changed color about every 10-15 stitches, which accounts for the much more mottled appearance of the O. Very different looks, but I love them both! I love how they ended up looking like lavish block capitals in a gorgeous book of fairy tales. 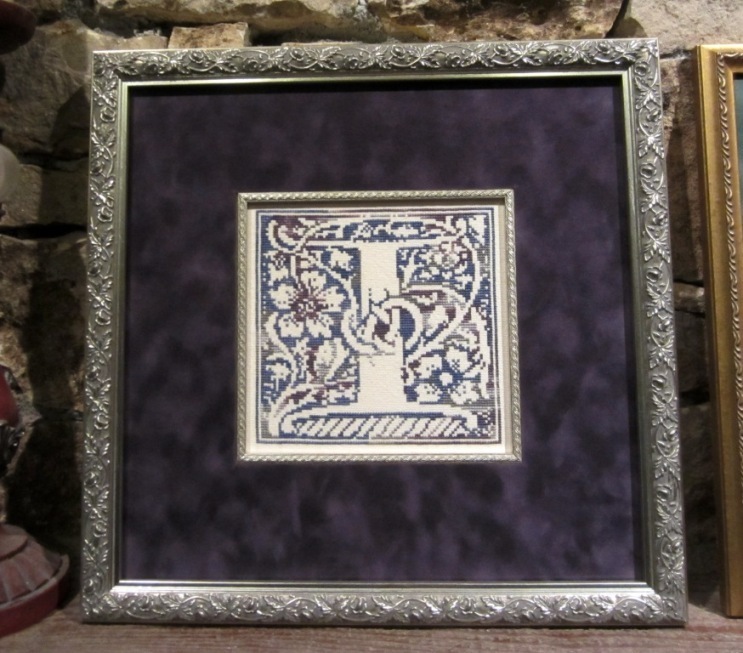 The frames have lovely viney motifs that reinforce that look. I chose slightly brighter mat colors than I’d planned—more crayon (or Koolaid!) colors than I was expecting—but they’re still beautiful and rich enough that the girls (and their parents) will enjoy them for decades to come.